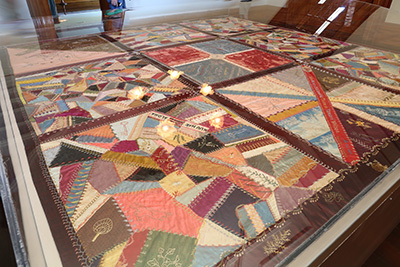 The art of Hawaiian Quilt-making is alive and well at Iolani Palace. Taught by Master quilter John Serrao and and his daughters, Cissy and Rae, quilting sessions are offered Saturday mornings from 9:30 a.m. – 12:00 p.m. Participants can join at any time and start at any level. Assistance is provided for new quilters. Fees for first session students is $15, subsequent classes are $6 per person. Classes are held in the lecture room of the Kanaina Building (Old Archives) on the Iolani Palace Grounds. For more information, see Hawaiian Quilting with Poakalani & Co. or call 808-534-3849. Iolani Palace is a living restoration of a proud Hawaiian national identity, registered National Historic Landmark and the only official royal palace in the United States. Located at the corner of King St. and Richard St. in downtown Honolulu (more details). “Smoking, Use of Electronic Smoking Devices, or Use of Tobacco or Betel Nut Products is Prohibited by Law” in all state parks including Iolani Palace grounds.